Although we were a little bit hesitating to post this information (were collecting more details), it’s about time to do it now. Remember the mysterious MMO from Blizzard? The one that is currently in the development and is expected to hit store shelves sometime in 2011-2012? Guess what? We know their little secret. It’s World of Starcraft, MMO. Is it really called World of Starcraft? No, although we did not know the real IP name, it looks like the actual name is: Starcrat Phoenix. Well, they have to finish it, obviously. However, the second reason is this: World of Starcraft is set to follow the events of last Stracraft 2 expansion that is Legacy of the Void. It’s a MMO. No, not a regular (WoW like game) one. Think about it as a hybrid of Mass Effect 2 and Warhammer 40K Dark Millenia, add Command & Conquer Renegade ideas and you have it. 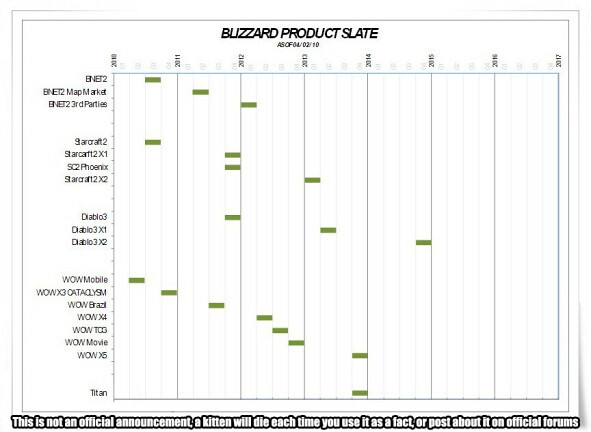 Remember when Blizzard was hiring for the “potential” console game (everyone thinks it’s Diablo). Guess what? It’s not a direct competitor to WoW because setting is completely different. It is for Starcraft Phoenix and yes, it will be a PC/Console MMO. You see, it would not make sense to create the second MMO on a popular franchise unless you can actually sell units not only to PC gamers but also console ones. So here you have it. All you have to do now is wait. WOW… Just can’t wait to see the first screen shots! A teaser would be a nice Christmas present! Do you know how many kittens died because of this post? DO YOU!!?? DO YOU!!!!???? DDOOOOOOOOO YOOOOOOOOOOOUUUUUUUUUUUUU!!!!!!!!!!!!????????? They already specifically said it was going to be a brand new IP, genius. Anything for hits I suppose! Way to fundamentally misread that chart. SC2Phoenix is quite clearly nestled between the two Starcraft expansions, so it’s obviously something to do with that. 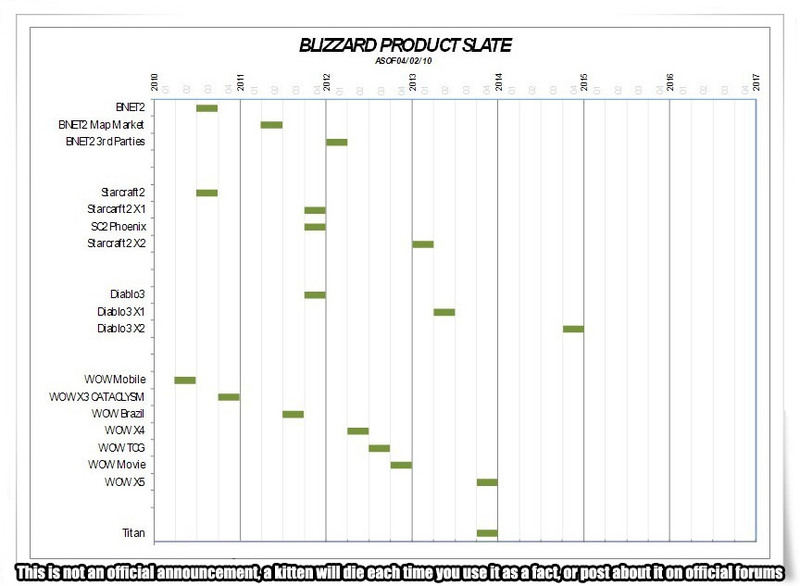 What you’re really looking for is right at the bottom by itself, Titan, which Blizzard has confirmed is their unannounced MMO. Titan is the MMorpg. Phoenix will most likely be a first person shooter similar to halo. I love how much made up ‘facts’ are in this article. Who says StarCraft 2: Phoenix is an MMO. I demand proof. Id just like to point out it was diablo 3 for consoles and a card game. Plus battle.net and starcraft expansion. Wheeeee im from the fuuuture.